The days of summer brought a change in our “diet” on 25 Alston Avenue. Cookouts… hamburgers, hotdogs, london broil, sweetcorn, chicken & watermelon (the basics). Pink lemonade and Iced Tea (served in the pitcher that had an English hunt scene done in relief). There was another food essential that can not be left out. Mom’s vinaigrette salad. 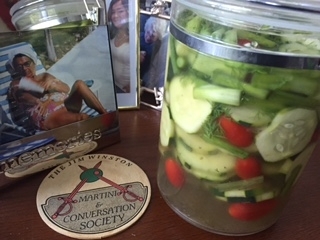 A simple composition of cucumbers, scallions and cherry tomatoes. It was the “green” side dish that appeared on the table regardless of the entree. This salad was kept in a 2qt jar stored in our fridge, and regardless of how it was attacked, the jar was never empty, never absent. Obviously it was being continually being replenished during cookout season by the kitchen staff: Mom, Mommie Soph & Bessie. I loved that salad, and fork in hand I would often snack on it straight from the fridge. And when I was a teenager (with the metabolism of a hummingbird) on a late night refrigerator raid I would knock off two cold hamburgers and several mouthfuls of vinaigrette salad. I just came across a recipe for a cucumber and onion salad which reminded me of Mom’s salad. So on this past rainy Sunday I decided to give the recipe a test drive. I replaced the onions with scallions and added the necessary cherry tomatoes. The recipe also called for a tablespoon of pepper. I don’t think Mom used pepper; but I decided to add it to the vinaigrette… further, I think Dad, who loved pepper, would approve! I also added some fresh dill… because I love fresh dill, and it’s in my herb garden! n.b. In a recent correspondence with Paula she attributes the original architect for the salad to Mommie Soph. I have placed it with Mom because I saw her make it. Although she could have easily learned it from Mommie Soph. Several cherry tomatoes (or grape tomatoes) for “color”. Place in a 2qt jar that has a good lid to seal contents. Turn upside down and back several times to mix ingredients. Keep in the fridge. Serve cold, and replenish as circumstances warrant.